Fluctuations in foreign exchange rates are generally in line with the direction of the moving average. The moving average cycle length is a very critical factor: when the MA short cycle sensitivity is high, the accuracy is relatively low, when the MA long cycle sensitivity is low, the stability and accuracy is relatively high. For example, 1 min MA sensitive is higher than 5 min MA, 60 min MA cycle length is longer than 5 min MA, but 60 min MA line represents the direction of the trend more accurately. 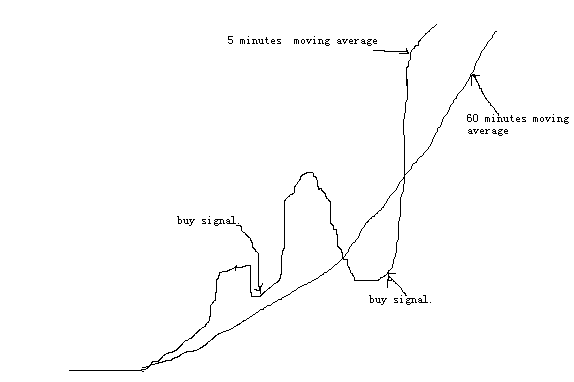 The more accuracy there is, the longer the period of moving average is. Let’s refer to the rising trend of the 60 min MA and 5 min MA in 60 min MA to run the online side. Then, when the 5 min MA deviation occurs, pay attention to the 60 min MA trends. As long as 60 minutes of moving averages don't turn head down, the upward trend will not easily end up. There is a buy signal in a rising trend. When the MA deviation occurs, pay attention to the long-term moving average trend: long-term MA in general, such as 60 min MA form the inflection point only two or three times a day. Once formed, the trend is difficult to be changed. When the direction of the long term MA line and the foreign exchange price is of the same direction, there will be two situations in the market that is the long array of MAs and the short order of MAs. Whatever the rising long array is or the falling short order is, the movement direction of the FX price will be consistent with the direction of the moving average operation, this is the meaning of the trend. Operation should be selected with the long-term average FX price in the same direction, and are up " long array ," because at this time Forex prices are homeopathic. Moving averages turn from the falling case to the levels case, FX price goes from down to up, making a breakthrough in the moving average – this is a buy signal. FX price on MA runs the online side, back to the moving average – this is a buy signal. Foreign exchange prices fell to the moving average downline side, while the average short-term still keeps on rising – this is a long adjustment signal. Moving averages rise gradually and go flat, and then down below the moving average FX price – this is a sell signal. Foreign exchange prices hover around the moving average line and moving average keeps on falling – this is a sell signal. The article is written by Yue Jin Liu and is participating in the Forex Article Contest. Good luck!